Three explosions were reported in two different sites in the Belgian capital Tuesday morning. The CEO of the airport where the deadly blasts took place this morning has now confirmed that there was a third bomb at the airport that did not explode. It was neutralized by police. 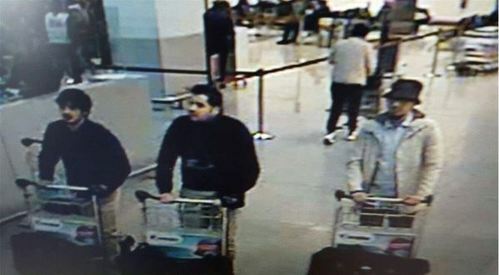 A spokeswoman at the Belgian federal police confirms to ABC News that a picture they have released shows the possible suspects from the deadly blasts at Brussels’ main international airport today. ABC News does not yet have a confirmation on their identities or which, if any, are alive. It is unclear how police identified these individuals as the suspects. The photo, taken from airport surveillance footage, shows three men walking with baggage carts through the airport. 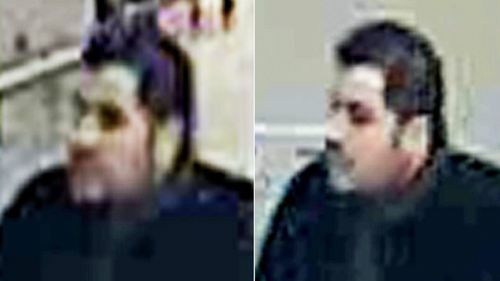 Belgian Federal Police have just issued a release calling for help finding one of the men pictured in the surveillance footage. The man, seen on the right of the photo, appears to be wearing a hat and a lighter colored shirt. In the release, written in French, the police say that they are looking for this man who was seen at the Zaventem airport this morning. They urge anyone who recognizes the man or knows his whereabouts to call police. 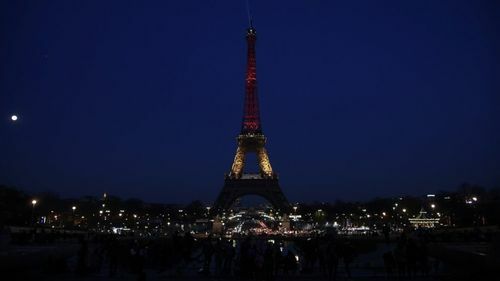 The Eiffel Tower isn't the only world landmark scheduled to pay tribute to the victims of the Belgian terror attack. New York Gov. Andrew Cuomo announced that One World Trade Center will be lit up in the colors of the Beglian flag. "Once again, our world has endured another senseless tragedy due to the cowardly acts of truly evil people, but the global community remains united, he said in a statement. "New York stands shoulder to shoulder with the people of Belgium and the rest of the world in rejecting the hate and extremism behind this violence. As we have seen time and again, when we are united, terror has never prevailed and never will." A spokesman at Belgium-based energy corporation Electrabel confirms to ABC News that a number of employees at Belgium’s nuclear plants in Tihange and Doel have been asked to go home due to the alert level being raised to a level four. The plants are still operating as normal. About 100 to 150 employees are still working in each location. The Belgian federal prosecutor has confirmed in a statement that raids conducted in response to this morning's explosions have uncovered new evidence. The raids in an area called Schaerbeek have led to the discovery of an explosive device containing nails. Investigators have also found chemical products and an ISIS flag. The evidence found has been connected to this morning's deadly blasts. Belgian authorities will do “everything” they can to reopen public transportation, Belgian Prime Minister Charles Michel said, in French. The terror alert level in Belgium will be reassessed tomorrow. Michel called the attack the “worst” the country has known. More security measures will be announced tomorrow, he said. It is too early to draw any link with the Paris attacks, Belgium Federal Prosecutor Frédéric Van Leeuw said. "Freedom was attacked in its heart, like it was attacked in Paris, in London, and in Madrid. This is a fight we are fighting together," Belgian Prime Minister Charles Michel said. 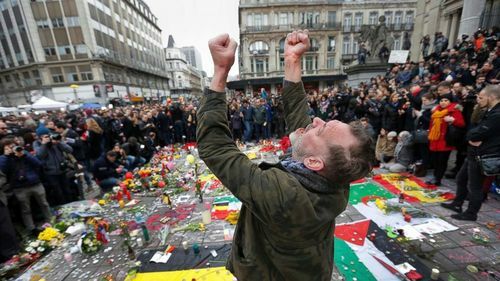 ABC News counts nine Americans injured in Brussels so far. 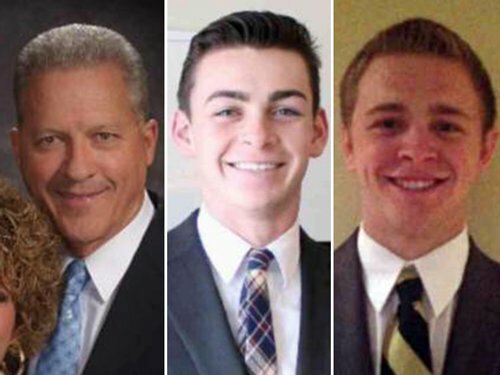 Among those injured includes a member of the United States Air Force, five of his family members and three Mormon missionaires from Utah. No deaths have been recorded, State Department Spokesman John Kirby said. 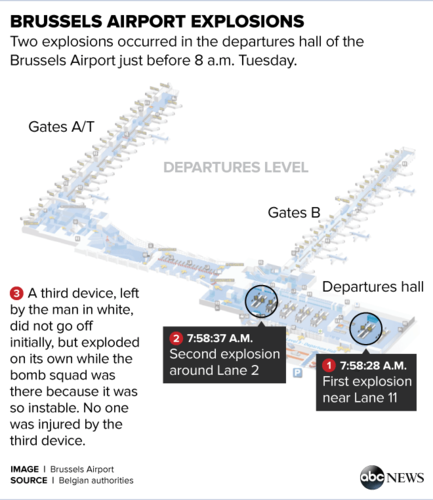 They were all at the Brussels airport at the time of the explosion. The status of their injuries has not been released. 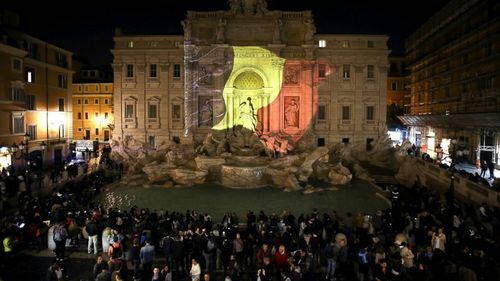 European capitals are showing solidarity with Brussels by projecting the Belgian flag onto iconic monuments such as the Trevi Fountain in Rome, the Eiffel Tower in Paris, the Brandenburg Gate in Berlin and the statue of David in Florence. 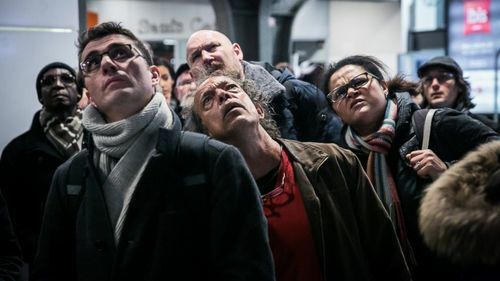 A third explosive that did not detonate at the Brussels airport was inside a suitcase, leading authorities to believe the other bombs were located inside suitcases as well, the Mayor of Zaventem told ABC News. The man in the middle of the airport surveillance footage has been identified by Belgian prosecutors as Brahim El-Bakhraoui. He was born in Belgium. His brother Khalid El-Bakhraoui was the subway suicide bomber. He had criminal records and though the charges were not released publicly, they were not terror-related, the prosecutor said. 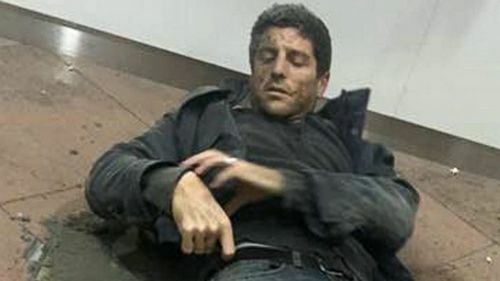 In a subsequent raid of the house where the taxi driver had picked up the three suspects to go to the airport, police found a written note from Brahim El-Bakhraoui. 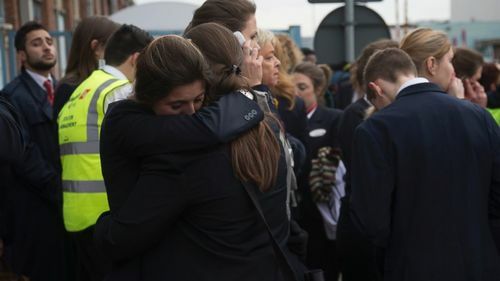 Four Brussels Airlines employees were injured in today's explosions and are currently hospitalized, Brussels Airlines Vice President of External Communication and Spokesperson Geert Sciot confirmed to ABC News. All four people were working at a check-in counter at the time. The explosions didn't happen right in front of them, but near them. Operations at the Brussels airport will be closed tomorrow. The ABC News live blog is now closed for the evening. Please check abcnews.go.com for continuing coverage on the Brussels terror attacks. 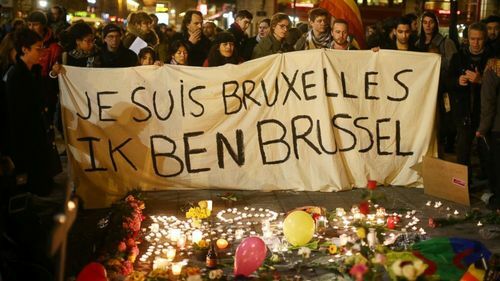 Belgian officials have given an update on the ongoing investigation in the wake of the deadly explosions in Brussels on Tuesday. 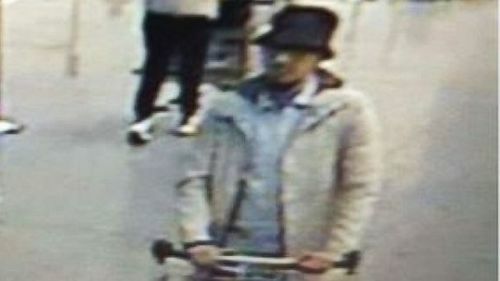 The manhunt for the only suspect from the Belgian terrror attacks is believed to be alive and on the run. Experts who analyzed the surveillance footage released by police said that it appeared the so-called "man in white" may have been a "handler" for the two suicide bombers. "You have him dressed a little differently, and you have him wearing a hat and you have him wearing glasses... It is enough that it causes it to be harder to identify the person," said former FBI New York counter-terrorism chief Rich Frankel, now an ABC News consultant. "He could be the person who brings them to the airport. He could be the individual who makes sure they actually carry out the attack, or if they are not able to carry out the terrorist attack, he’s able to spirit them away or advise his terrorist cell that it did not take place." Read more about the suspected attackers here. Belgian officials released a few more details about Ibrahim El-Bakhraoui, the one airport suicide bomber who has been identified so far. He was born on October 9, 1986, making him 29 years old at the time of the attack. He was identified using fingerprints, officials said. Investigators were able to find a written statement by him outside the apartment building where the taxi driver picked them he and his co-conspirators before taking them to the airport. It is unclear who El-Bakhraoui is referring to in the note. One of the three American missionaries injured in the airport bombings is now in a medically-induced coma and will remain there "for the next few days," his family said in a statement released today. Richard Norby, 66, is originally from Lehi, Utah and was serving in the Paris, France mission. He and two fellow American missionaries were dropping off a French missionary at the airport at the time of the attack. "He sustained several wounds from the shrapnel, second degree burns to his head and neck area, along with more severe trauma from shrapnel to his lower leg," Norby's family's statement said. "After a lengthy surgery he was placed in a medically-induced coma, and will remain in this state for the next few days, with a lengthy recovery expected." Erdogan did not name the attacker or identify which blast site the suspect was associated with. Erdogan says "despite our warnings that this person was a foreign terrorist fighter, Belgium could not establish any links with terrorism." State Department spokesman John Kirby said Secretary of State John Kerry will travel to Brussels on Friday. The trip was arranged to "formally express the condolences of the United States for the loss of life in yesterday's terrorist attacks, and to meet with Belgian and European Union officials,: Kirby said in his statement. Kerry will be traveling to Brussels from Moscow. New clarifications have been made about the note investigators found that belonged to one of the two airport suicide bombers. 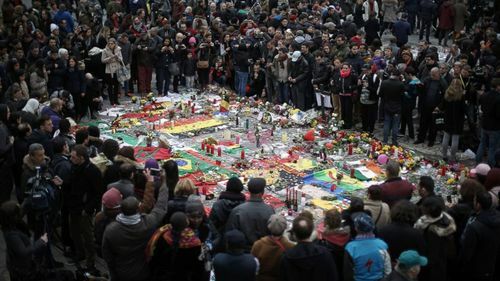 Ibrahim El-Bakhraoui’s note was described by Belgian prosecutors as being a "testament" and was found on a laptop in a trash can on the same street as the apartment the trio was picked up from earlier that day. The note included mentions of 'being in a rush,' 'no longer knowing what to do,' 'being sought everywhere,' 'no longer being safe,' and that if he takes too much time, he risks finishing his life 'next to him' in a jail cell," the official said. During the rest of the press conference this morning in Argentina, President Obama responded in-depth to the criticism he’s received for pressing on with his foreign trip in the aftermath of the Brussels attack. “We defeat them in part by saying you are not strong, you are weak. We send a message to those that might be inspired by them to say you are not going to change our values of liberty and openness and the respect of all people,” Obama said..
“A lot of is going to be saying ‘you don’t not have power over us’ we are strong our values are right, you offer nothing except death,” he said. Turkish officials are now saying that President Erdogan "mis-spoke" earlier when he said that the bombing suspect that had been previously detained in Turkey was sent back to Belgium, according to The Associated Press. There are now reports he was sent to another country but no further details have been confirmed. We will update once we have confirmed news. J'assure la chère population belge, toutes les familles des victimes et tous les blessés, de ma prière et de ma proximité. I wish to assure the dear people of Belgium, all the families of the victims, and all of those injured of my prayers and spiritual closeness. Assicuro la mia preghiera e la mia vicinanza alla cara popolazione belga, a tutti i familiari delle vittime e a tutti i feriti. Aseguro mi oración y mi cercanía a la querida población belga, a todos los familiares de las víctimas y a todos los heridos. Dutch & Turkish officials confirm to ABC it was Ibrahim El Bakraoui - one of the airport bombers - who was detained on the Syrian border in July and deported to the Netherlands, and not Belgium. Turkish authorities have confirmed that they did warn both Dutch and Belgian authorities that El Bakhraoui was a "foreign terrorist fighter." Read more details about the chaotic day here. Both of the bombs that went off Tuesday morning at the airport were in the departures hall, before any security checkpoints.